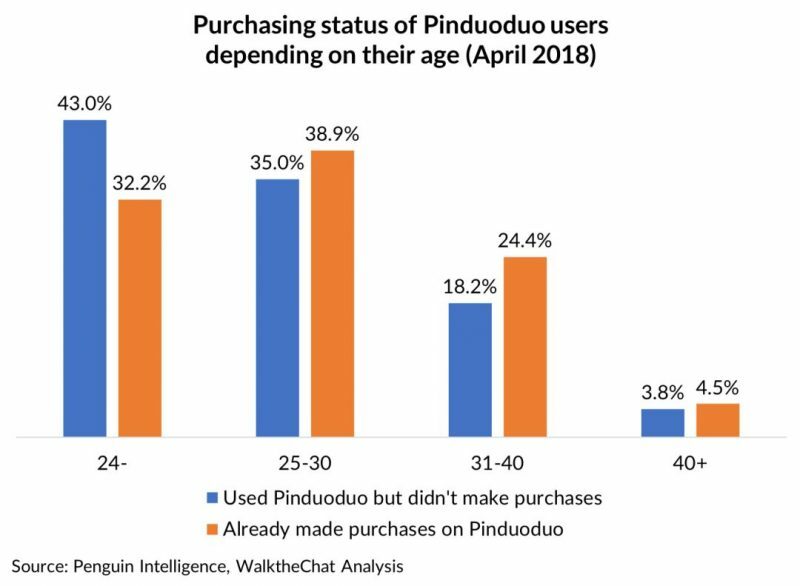 Overall, Pinduoduo users bargain-hunters, more likely to buy an expensive product that is heavily discounted than cheaper yet undiscounted products. Pinduoduo went through their IPO a month ago, and has been under the spotlight ever since. 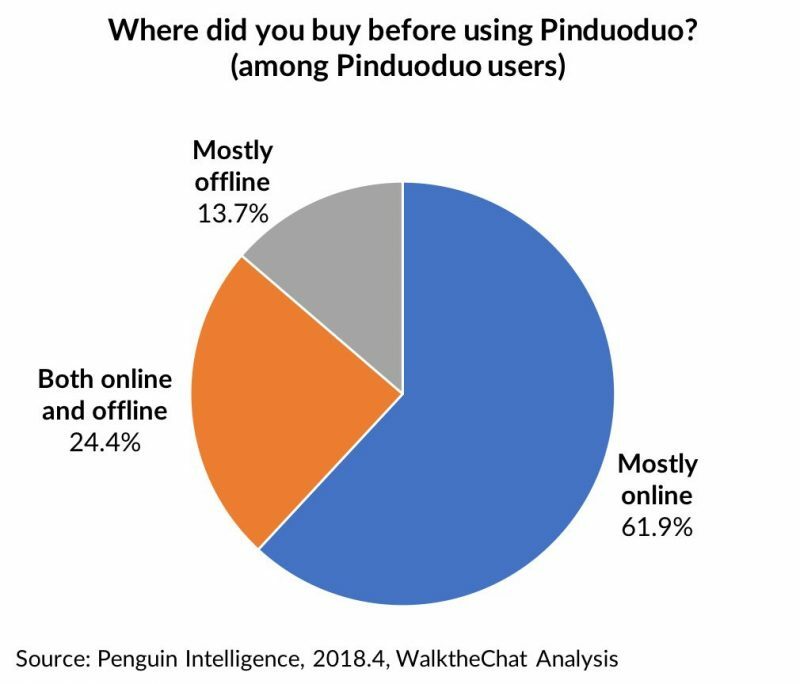 Here’s the latest data about Pinduoduo and its users. 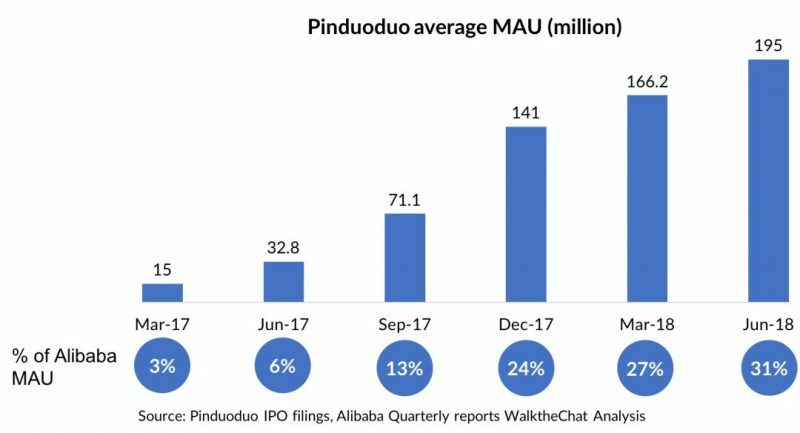 Pinduoduo went above 100 billion RMB per year of merchandise sold on the platform 2 years after its launch… it took 10 years for JD.com to get there. 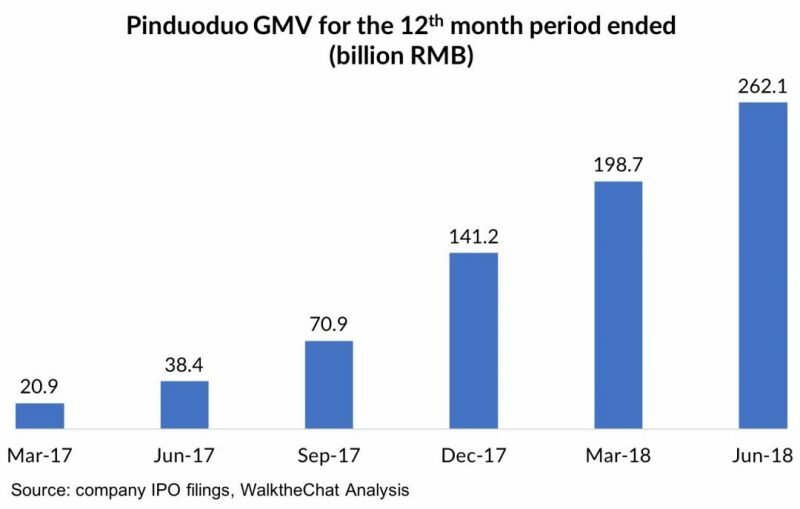 Gross Merchandise Volume (GMV) has been exploding on Pinduoduo reaching 262 billion RMB in June 2018, just before the IPO. The number of users has also been steadily growing. 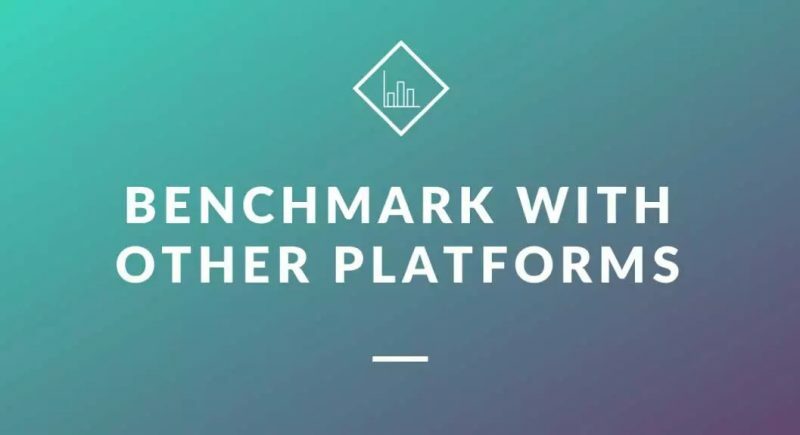 In a bit more than a year, the platform went from 15 million users (3% of the Alibaba user base at the time) to 195 million users (representing 31% of monthly active users of the total Alibaba ecosystem). 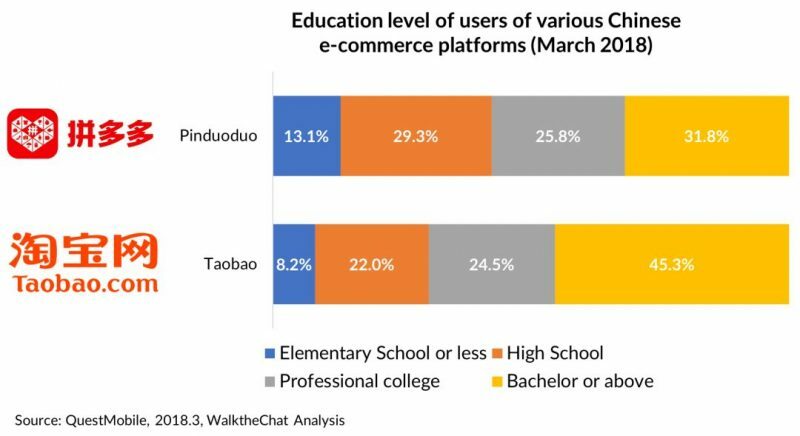 The users of Pinduoduo are also less educated than Taobao users: 42.4% of them don’t have any college degree, against 30.2% in the case of Taobao. 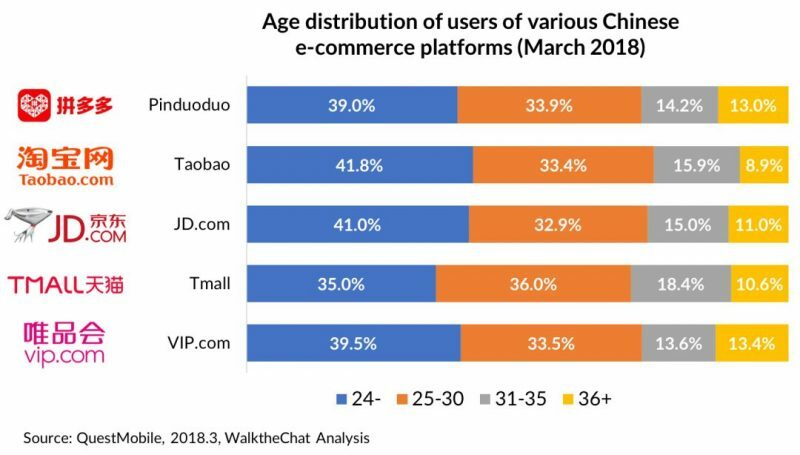 Among Monthly Active Users, the majority of users who made a purchase are between 25 and 40 years old (63.3%). 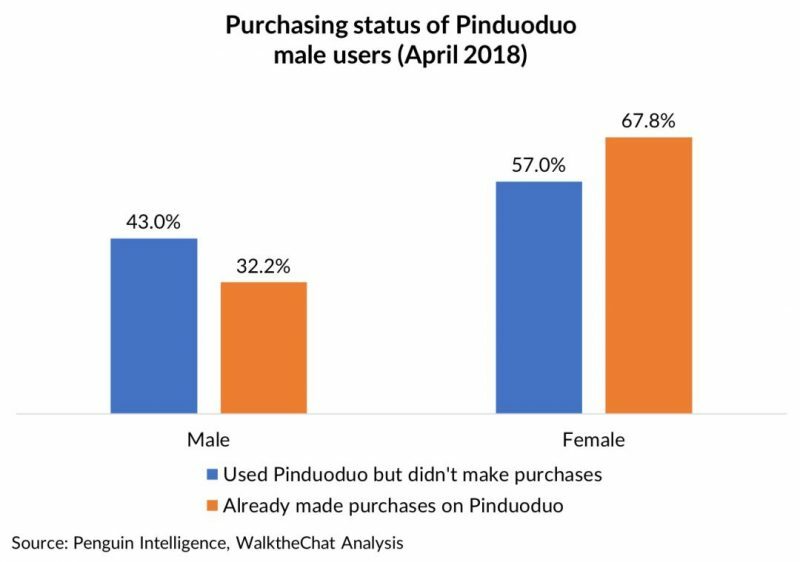 Female users are also more likely to be active buyers: they make up MAU’s 67.8% of users who made a purchase on Pinduoduo. 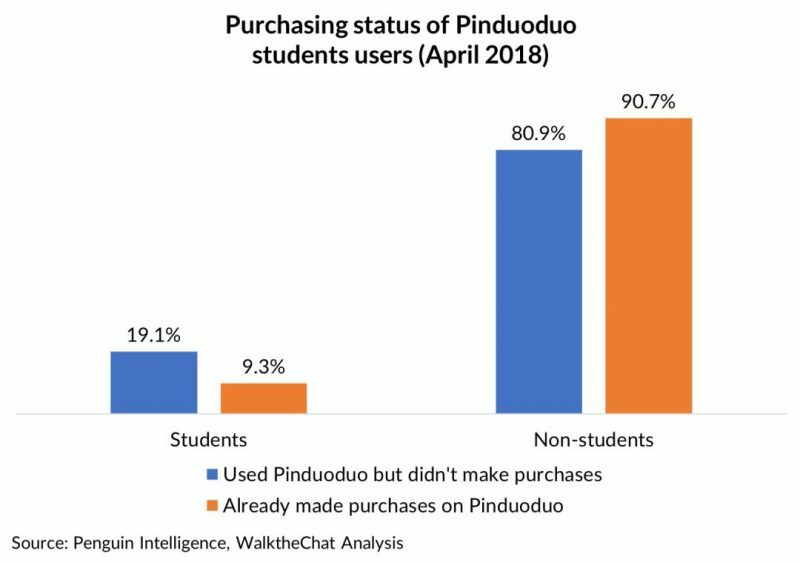 Students on the App are also more likely to use it without purchasing: they make up for 19.1% of non-purchasing users, but only 9.3% of active buyers. 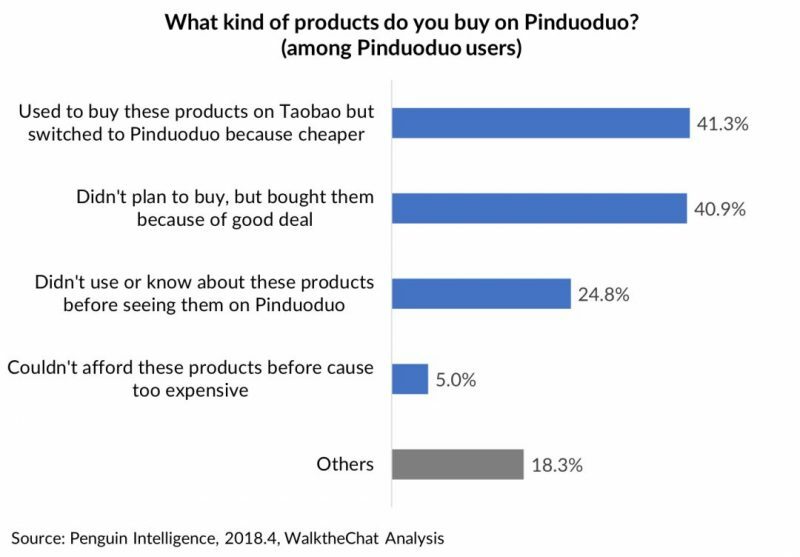 Overall, Pinduoduo users are looking for a bargain: they declare being more likely to buy an expensive product that is heavily discounted, rather than a cheaper products without a discount. 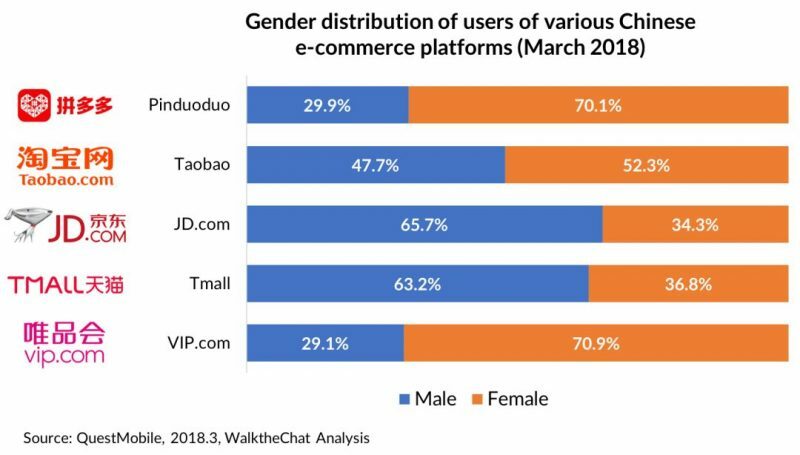 Pinduoduo users are mostly displaced from Taobao and other platforms: they are for the most part (86.3%) users who are usually used to buying online. 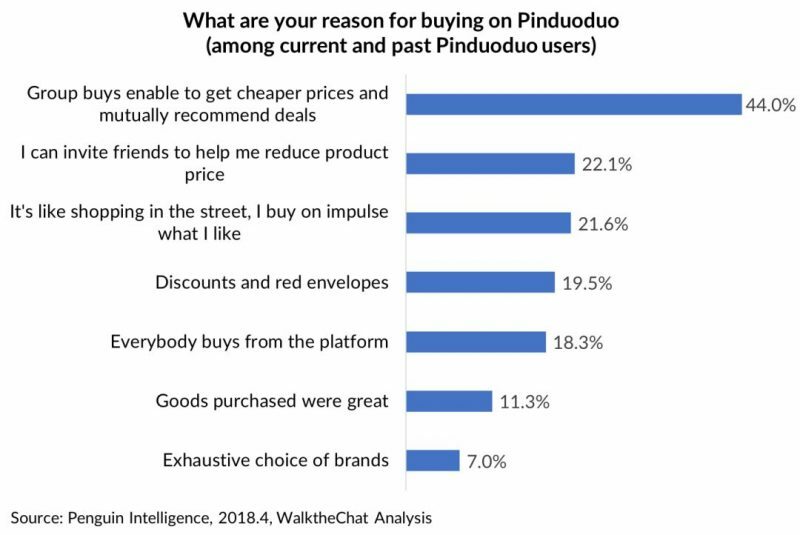 The group-buying feature of Pinduoduo is by far the most important incentives for people to use the App, both for price discounts and recommendations. 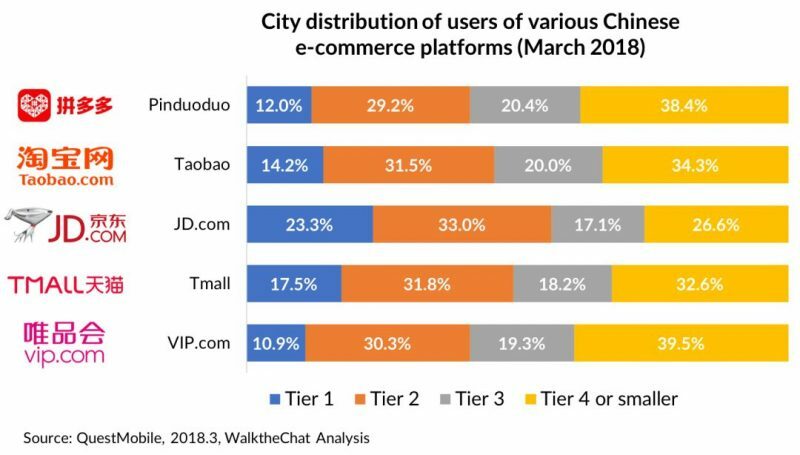 For the most part, users are buying products that they used to buy on Taobao (41.3%). 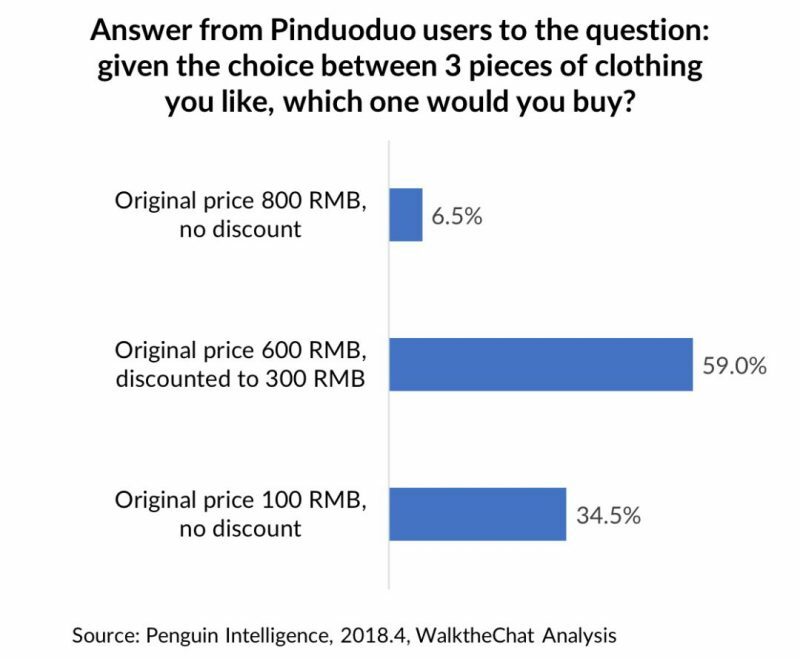 There is however also a significant percentage of users (40.9%) who are buying products on impulse that they didn’t plan to buy otherwise. 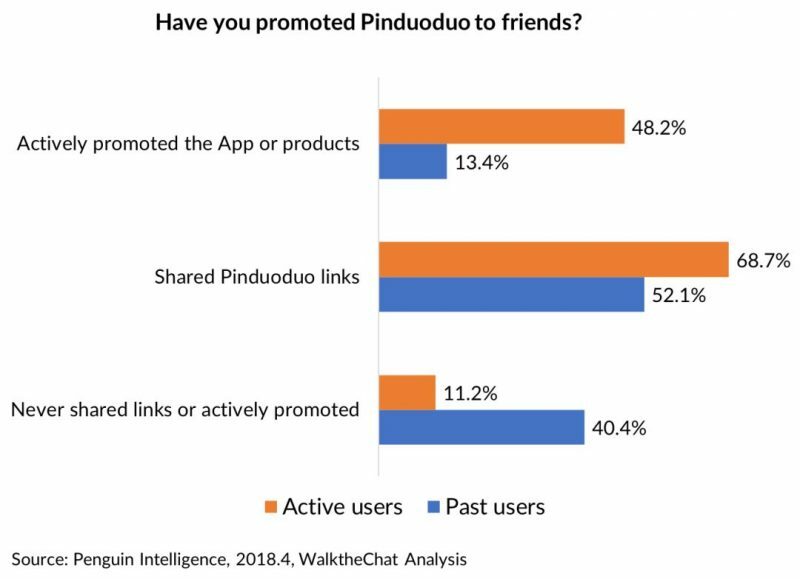 The power of Pinduoduo mostly comes from its social features: only 88.8% of active Pinduoduo users helped promote the platform in some way, either via sharing links or actively promoting products. 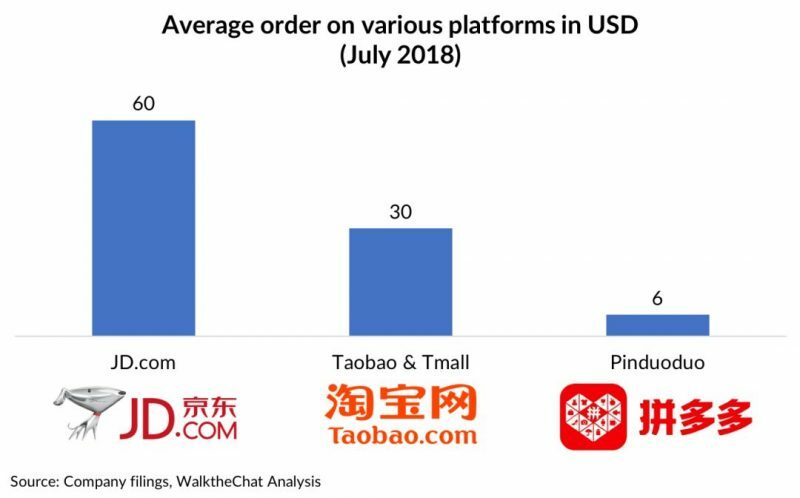 Average orders on Pinduoduo are, as one might expect, low: 10 times smaller than the average orders on JD.com. 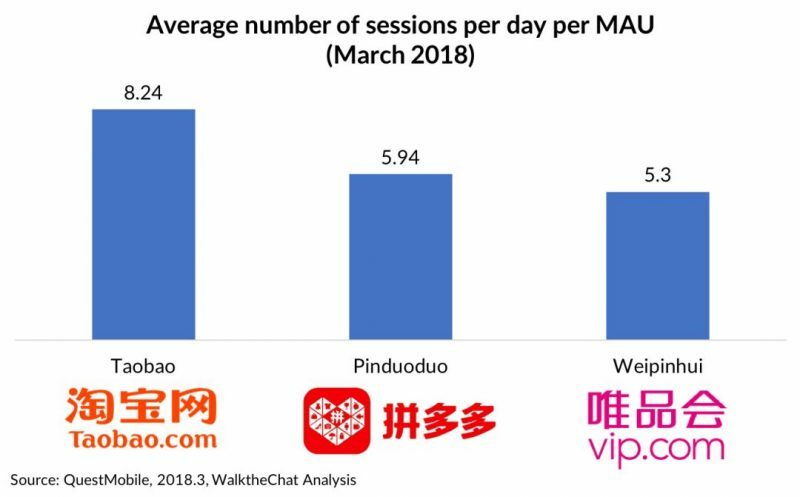 Users remain more active on Taobao than on Pinduoduo, both in terms of number of sessions and time spent on the App. 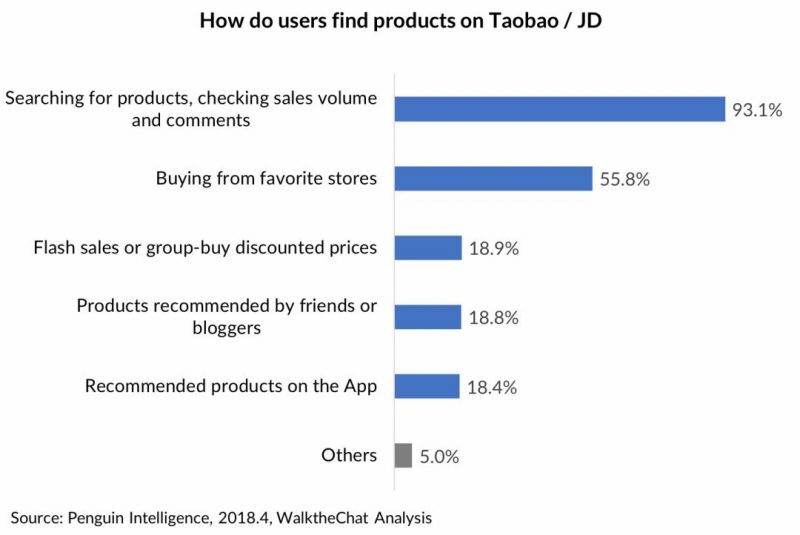 Taobao/JD and Pinduoduo have completely different user behaviors: 93.1% of Taobao/JD users find products through keyword search, while most of Pinduoduo users are looking at which special deals are available every day. 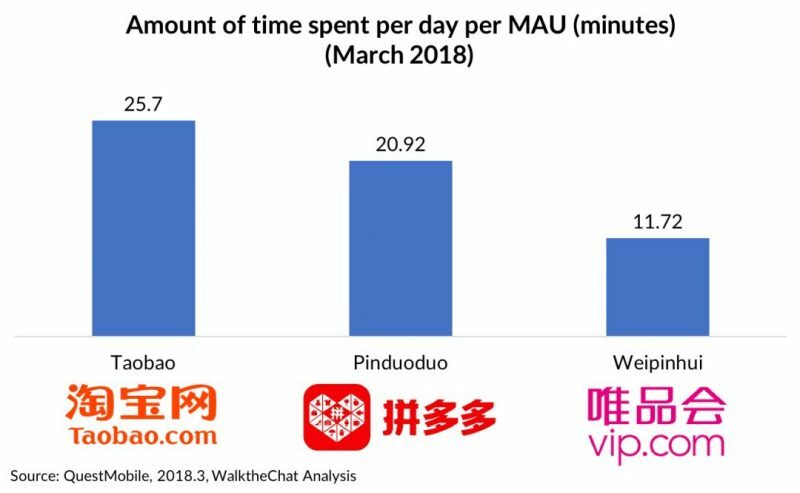 This is made possible by the AI behind Pinduoduo, which is pushing the right products to the right users based on product popularity and users purchase history. 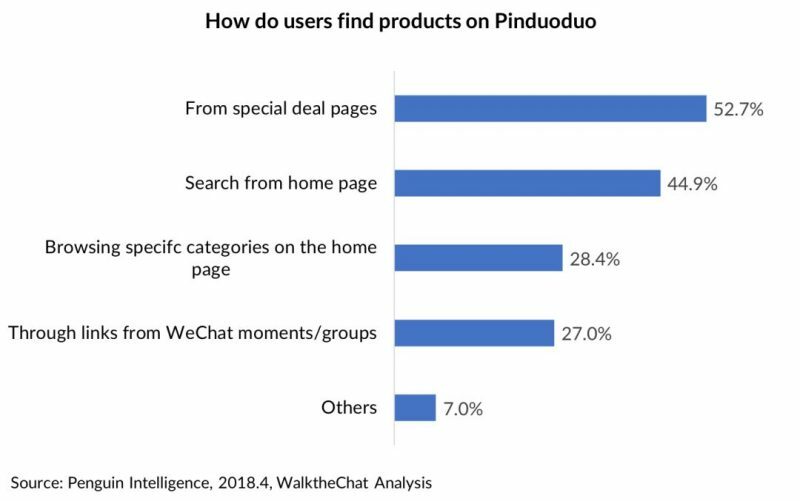 Pinduoduo is also seen as a more meritocratic system for products: good products which get a lot of attention can find their way to the top of the rankings even if they are not coming from large brands/stores. Originally posted on WALKTHECHAT, written by Jenny.